Wow. 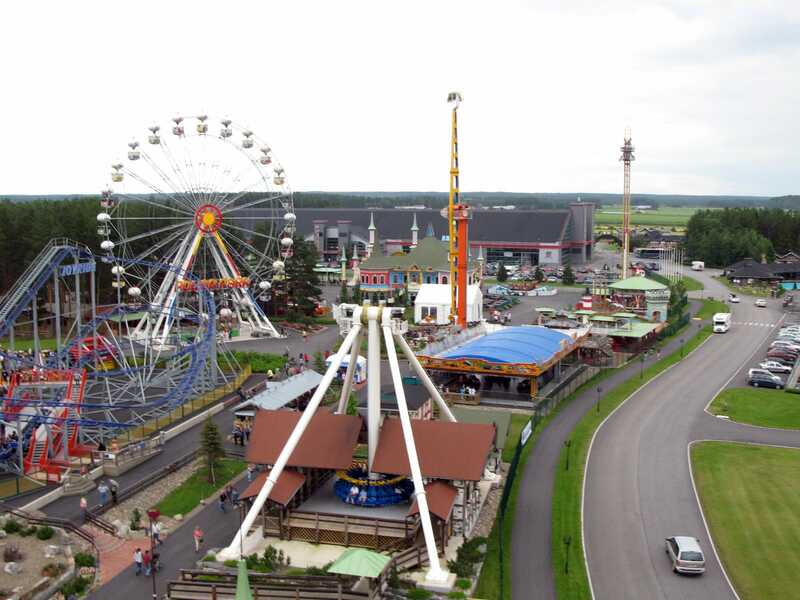 There is no other word to describe PowerLand, an amusement facility hidden in the far north of Finland. Though a relatively small park, it is nevertheless home to a superb selection of attractions. Families can enjoy what looks to be the lion's share of the Zamperla ride catalogue. Adrenaline junkies are more than catered for with three adult roller coasters and the two most serious machines in the Fabbri ride catalogue, Mega Drop and Booster. The former was being run as it might be in a fair, with a good long wait before the final drop sequence. The latter? Well, anyone who has ever ridden a booster will testify to the incredible ride experience it gives, and this one didn't disappoint. We also tried out a Star Flyer clone, which provides probably the best photo angles for the park. At this point a difficult task awaits me, namely the job of convincing you, the reader, that a Vekoma Boomerang was actually really smooth and rerideable. Cobra (#985) is the debut installation for a new train design from Vekoma, which has a trailered wheel design licensed from B&M. The result is positively stunning; we were all braced for the ubiquitous headbanging as the train dropped, only for it to be completely absent. The result is amazing. The owners of the other fifty boomerangs should take note! Joyride (#986) looked at first glance like a run of the mill carnival coaster, and indeed it was designed to be portable thanks to its base frame. It rides far better than might be expected though, and while we didn't ride more than once it was only because other coasters beckoned. The Mine Train (#987) was the obligatory credit whore, and a punishing experience for some of the larger enthusiasts who tried to shoehorn themselves on board. I'm pleased to say that the cars were just about big enough for me, though a little extra leg room would have been beneficial as always. This brings me neatly to the real reason for visiting the park, namely Thunderbird (#988). This is without question a top ten attraction; it might not be able to match Voyage in sheer intensity but it is well up there. The layout has a good mixture of sharp turns and airtime, and the wonderful millennium flyer trains cover the course with ease, so much better than a lot of other wooden coasters. One member commented that he would have to rebuild his top ten list, giving an entry for best GCI coaster so as to allow other wooden coasters to occupy some of the prime slots. Quite. The day finished with a truly amazing karting session on what were the fastest karts I have ever had the pleasure to drive. The outdoor circuit was pretty big, taking a little over a minute to complete for most of us, or approximately one minute forty for one member (Hi, Nick!). The sheer range of times shows better than words the power of the karts; coaster enthusiasts were choosing to drive slowly, which says rather a lot I think!